Today, my partner and I finished our story and reread it to add in more details. Now we are trying to find an app or website to help us create some what of a children’s book. We have to start drawing pictures and publishing our story. Today, my partner and I came up with a plot for our children’s story. We thought of a way we could show possible injuries or PTSD for the life of the character in our story who is a bird representing a veteran. We are still trying to find more facts about veterans’ benefits to add to our story plot. By our next class we should be able to start writing out our story and thinking of pictures to add or draw. We had some trouble thinking about how we could fit in everything necessary to get a good grade from the rubric, but with the help of Mrs. Dille, we came up with a couple ideas like adding on an author’s note or epilogue. So, we continue to look forward to seeing what we come up with for our project. The genre for our project is going to be a short children’s story. At first, we thought to just write a legitimate story using our interviews or stories from our relatives who are veterans to generalize the life of veterans. But then, we researched stories that had a deeper meaning farther than the eye can see and that was when we came across Dr. Seuss’s stories and how they actually portrayed something way different than just an elephant who finds a who in Whoville. We then decided to create a story about a bird who leaves the nest to find food for his family to compare to the life of a veteran who leaves home to protect and help the country. We looked at three Dr. Seuss books to get an idea on how to write a good story that catches the attention of our intended audience while still referring to a real life situation. The Lorax, The Sneetches, and Horton Hears a Who all have a moral back story. For example, in Horton Hears a Who, he says, “the black bottomed birdie let go and we dropped / We landed so hard that our clocks have all stopped.”. With that quote, he is referring to a plane releasing a bomb in World War II. They all include pictures, explain the context, and have a rising action, climax, falling action, and a resolution. In order for us to create this story we need to include these things while still adding our own research to the plot. For my topic I chose veteran lives because it seemed the easiest to do for my partner and I because we have family members who are veterans. It is also cery important to us to get this point across to the community and the government from the lack of help they get when they come back home. We are planning on interviewing a couple veterans we know to prove how they don’t get the benefits they are promised or deserve. We hope that this makes the government and the community understand what they go through to better the situation when they hear stories from their tours and life back home. It will probably be in a video format to catch their attention better than an article would. Ben Carson, a candidate for United States President, uses his website to attract people with his shared beliefs to support him in the race and see him as the best choice to vote for. Bencarson.com presents mostly verbal messages to share out the candidate’s thoughts on how the United States could be bettered. He mostly uses ethos and pathos, but barely uses logos to reel in America’s voters. Carson’s intended audience is middle class voters who value Christianity, education, and better, affordable health care and living. 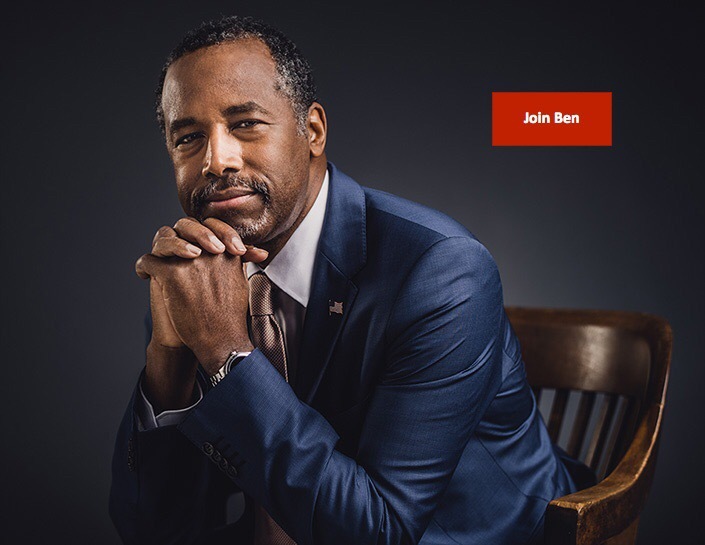 Right at the top left of the home page to his website, he has a button that says “Ben on the Issues” where we see his view point on America’s issues. In order, the first three are “Protecting Innocent life”, “Balanced Budget Amendment”, and “Education”. Being Pro-life is mostly a Christian belief and he is trying to fix our debt and make life more affordable. Since he was a doctor and had a hard time with his race trying to do the best he can in school, education is something he values a lot and wants to see other people value it as well. To persuade his audience to vote for him, Carson relies mostly on ethos. He portrays himself as someone who values education a little bit more than anything because of his back story that he shares through his button at the top left called “Ben Carson’s Story”. At that page, he also includes a picture of him and his wife smiling at eachother which portrays him as someone who is happy and married like anyone else. He not only relies on his appearance through ethos to attract voters. His site also includes a good amount of pathos. He also has a page called “Ben on the Issues” that shows his values and his view point on the issues of the world to get people to agree with him and support him. To appeal to the audience’s emotions he includes a video of his hard-fought childhood and life toward medicine and now politics in “Ben Carson’s Story”. The final appeal that Carson employs is logos. In each of his pages linked to his website, he has things organized to where the most popular are at the very top and the least popular at the end. His website is very organized in the way that there is a specific link for everything you need to know about him or his plan as president. In conclusion, Ben Carson started off as one of the candidates no one knew much about until recently. He has taken over Donald Trump’s spot as the number one Republican candidate in many states and maybe even nationally. What appeals the most to the audience is his use of a bit of ethos and pathos when he shares his story. They like knowing that he knows what it is like to have struggled in middle class life unlike most higher class candidates.